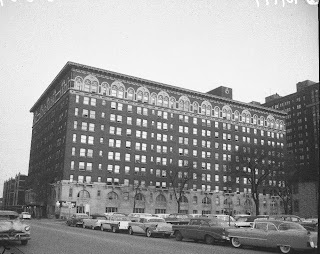 The Sovereign Hotel, at 6200 Kenmore, as it looked in 1957. The Sovereign was designed by Walter W. Ahlschlager. Ahlschlager was the architect who designed the elaborate terracotta Broadway Building, the Sheridan-Plaza Hotel at Wilson and Sheridan, and the Pantheon Theatre (torn down) on Sheridan, just north of Wilson. To see the original floor plans of the Sovereign, go to Walter Ahlschlager PDF.